This hose is rated at 240 psi for use with suction and transfer service for a variety of chemicals and acids. T519OE will handle 98% of existing chemicals. Also is suitable for use with DEF. 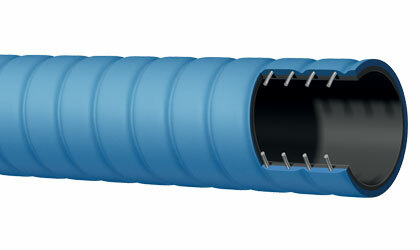 The tube is made from transparent UHMWPE (Ultra High Molecular Weight Polyethylene) and is reinforced with synthetic textile cords and a flexible steel helix wire. The corrugated cover material is blue EPDM which provides abrasion and ozone resistance. Available in ID sizes 2", 3" and 4". Click here for more info.